How did the decision to hang the gongs in the window come about? 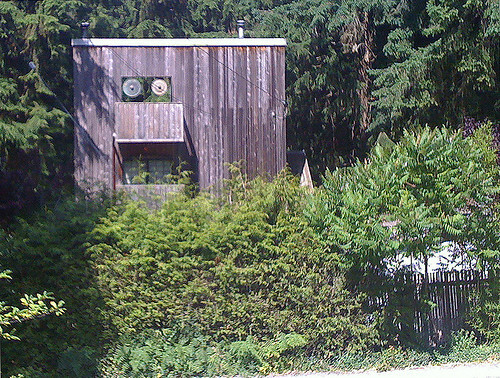 “Without eyes, our house is just a faceless shed?” Cool 70s modern house near the river, North Vancouver. This entry was posted on Friday, April 9th, 2010 at 12:05 am	and is filed under architecture, British Columbia, Vancouver. You can follow any responses to this entry through the RSS 2.0 feed. You can leave a response, or trackback from your own site. 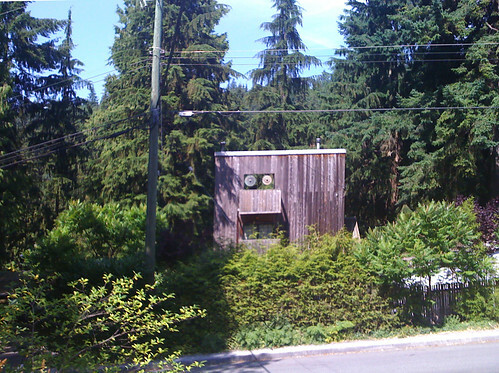 I’m always surprised at what works architecturally in a densely wooded setting. As long as it’s strong enough to withstand a tree dropping on it, almost any structure gains from that environment.